Following a family bereavement Mr and Mrs Jenkins inherited an old house with a large garden in a great location in Paignton. The dilemma was whether to refurbish the house to live in it and sell the land or to build their own new home. They took the decision to sell the old house in order to fund a low-running-cost modern home to suit current and future needs. ‘We decided that, as we lived three hours’ drive away and had no knowledge of the building trade, a Project Manager would be essential. We reckoned this cost would be far outweighed by the potential costs of “errors of judgement” due to our lack of knowledge. We looked for someone with a proven track record of building homes and a knowledge of timber frame construction. 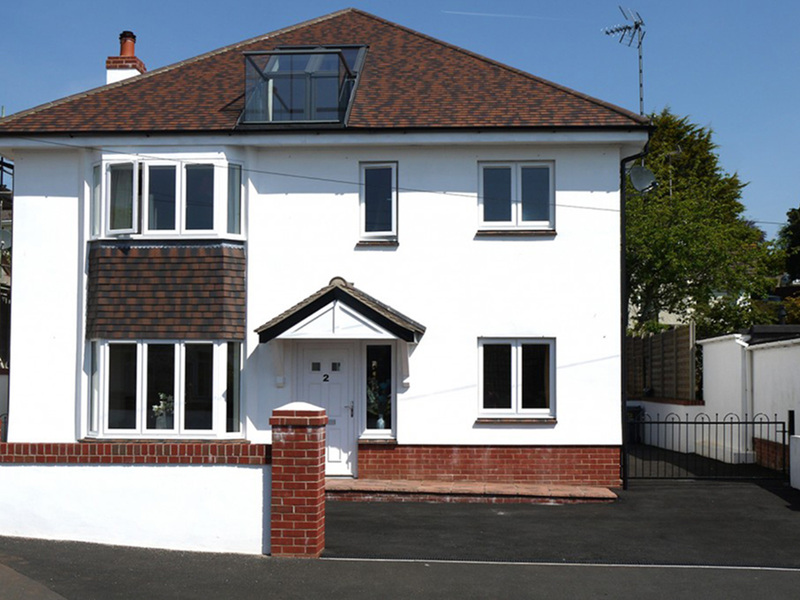 We met with Sean Parker at the Swindon Self Build Centre and decided to engage his services.’ For this site, in the heart of Paignton it was necessary to obtain Party Wall agreements with both immediate neighbours. The warranty company required full geotechnical surveys to be completed and the groundwork team were quickly on site and clearing the overgrown plot followed by “muck removal”, digging and construction of foundations – six months later they were in! Liaison with architect, planning and environmental representatives and contractors. Development and management of project plan & speciﬁcations. Identiﬁcation of appropriate subcontractors and management of tender process. Party wall initial notices and liaison with neighbours. Site supervision. Completion with NHBC and Building Control.